Raj Kumar and Sandeep entered into a partnership in vesting Rs 48000 and Rs 54000 respectively .After 3 months Jugal Kishore also Joined the business with a capital of Rs 40000. Find the share of each in a profit of Rs 55000 after a year. A,B and C hire a grassland for Rs 2934.60. A puts in 10 cows for 20 days; B 30 cows for 8 days and C 16 cows for 9 days . What is the rent paid by Raju ? A is working partner and B is a sleeping partner in a business. A puts in Rs 5000 and B puts in Rs 6000. A receives 12 1/2 per cent of profit for managing the business and the rest is divided in proportion to their capitals. How much does each get out of a profit of Rs 880 ? Khan and Bhat started a joint Firm. Khan's investment was thrice the investment of Bhat and the period of his investment was thrice the period of investment of Bhat.Bhat got Rs 4000 as profit for his investment .What was their total profit if the distribution of profit is directly proportional to the period and amount ? . . 1/7 x P = Rs 4000 or P = Rs 28000. "A' Starts business with a capital of Rs 1200. 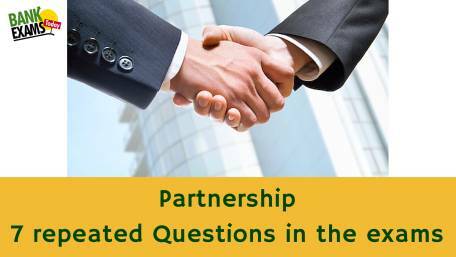 'B' and 'C' join with some investments after 3 and 6 months respectively.If at the end of a year, the profit is divided in the ratio 2:3:5 respectively, what is B's investment in the business ? Ans 5. A's investments is Rs 1200 for 12 months which is equivalent to Rs 14400 for one month. Thus, Rs 14400 is 2/10 of the whole euivalent investment i.e. 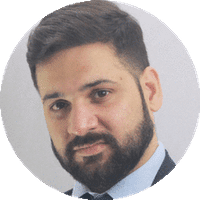 Rs 7200 is 1/10 of the whole equivalent investment. Since B's share is 3/10 of the whole equivalent investment, therefore B's Equivalent investment = Rs 7200x 3 = Rs 21600. 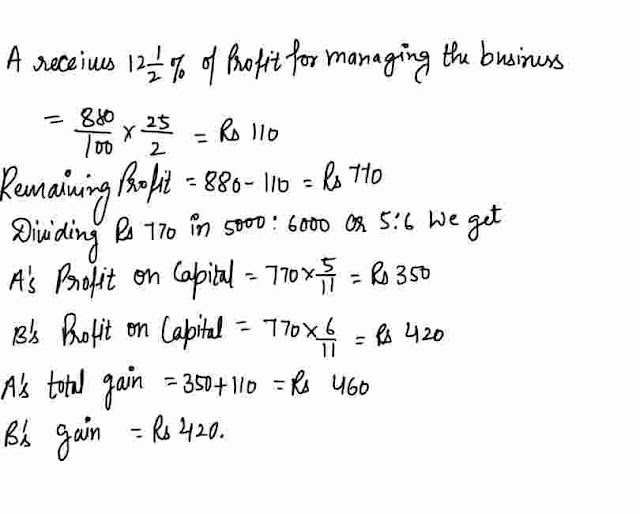 A and B invest Rs 12500 and Rs 8500 respectively in a business .They agree that 40% of the profit shall be divided equally between them and the rest divided in proportion to their investment .If A's share of profit is Rs 1950, what is B's share of profit ? 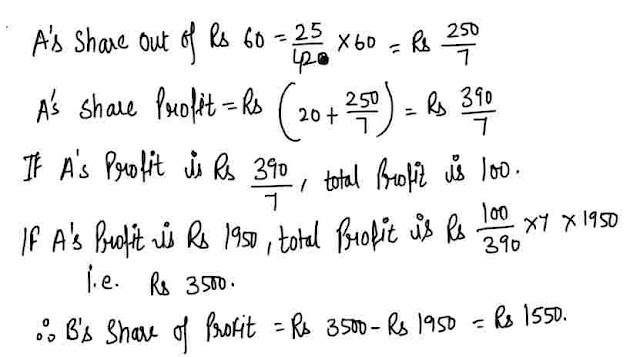 Ans 6. let the total profit be Rs 100. 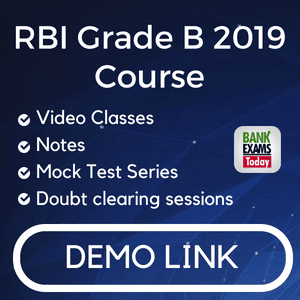 Rs 40 is divided equally between A and B and Rs 60 is divided in the ratio of 12500: 8500 i.e. 25 : 17. P,Q and R contract a work for Rs 1100.P and Q together are to do 7/11 of the work .Find R's share of the amount contracted for. . . R's share in total money = 1100 x 4/11 = Rs 400.